When we think of antelopes, many of us picture four-legged, deer-like creatures bounding across a blazing savannah. What may be surprising, however, is that members of this sub-group within the family Bovidae live in a wide range of environments, including grassland, desert, rocky terrain, frigid steppes, forest, and swampland. The majority of the 91 antelope species are found in Africa and include gnus and gazelles, but some species also occur in India, Central Asia, Russia, and the Arabian Peninsula. No antelope species is native to the Americas or Australia, however populations exist on those continents because of importation for exotic game hunting. Antelopes are distinct from other hoofed mammals like sheep, cattle and goats, although they are all classed under the same family. Their height and weight can also vary enormously depending on species. A common eland may measure around 70 inches tall with a weight of 2,090 lb, but its diminutive relative, the royal antelope, stands (on average) around 9.4 inches at the shoulder and weighs just over 3 lb – smaller than a housecat. The average adult lifespan of antelope is also hard to determine, since older or ill individuals tend to be slower, falling first to predators, but some species have lived beyond 20 years of age. Many species of antelope are typically known for speed, with long, slender legs, enabling them to take long strides. Others are known for their powerful leaping abilities, like the springbok and klipspringer antelopes. They have dense coats of short fur, varying from some form of brown (typical in most species) to grey, silver, black and white patterning, or darker vertical striping along their backs, depending on the type of antelope. One of the most unusual-looking species (as well as one of the most endangered) is the saiga antelope, which has an oversized, snout-like nose structure that helps to filter and warm the air it breathes. Like their related bovine cousins, antelope are plant-eating ruminants, meaning that they regurgitate a food ball (cud) from their stomach back into their mouths, using strong molar teeth to grind down the cud for further digestion. While some species browse mainly on grass stems and leaves, others eat fungi, fruit and leaves from the forest floor, and gerenuks and dibatags can stand erect on their hind legs in order to reach foliage above their heads. One or two species of duiker antelope have also been known to eat insects, birds, and occasionally small mammals as well. Some antelopes migrate to eat, following the rainy season, bird flocks and monkey troops, to browse on the leftover fruit they drop. As herbivores, antelope are prey animals, and have evolved some very effective ways to defend themselves from predators. Besides being fast runners or jumpers, they also have extremely sensitive senses of smell and hearing, as well as eyes on each side of their head, giving them a wide range of vision to help them detect danger more easily. Larger antelopes travel in large herds for protection, while smaller species rely on their dull coloring and thick brush to help them avoid becoming dinner. Antelope communicate with each other using ‘rump flashes’ (a danger signal), raised hair crests, and audible communications like whistles, barks, moos, and trumpets. Scent marking by rubbing their face on grass, trees, stones and logs is also used to claim territory and to lay a path for other members of the herd to follow. An antelope’s horns are also used to help them defend themselves, though more against competitors of the same species than against the nearest cheetah. Both males and females of most species have horns (with some exceptions), though the horns of female antelopes tend to be differ in size, especially in many of the smaller members of this sub-family. Some antelopes have simple ‘spike’ type projections, while others have straight, twisted, spiral or long curved horns. Species of antelope where males fight to compete for mates tend to have more highly developed horn structures. Unlike other hoofed mammals such as deer and moose, antelope don’t typically shed their horns. Mating behavior can vary quite significantly between different antelope species, though as mammals, all antelope give birth to and nurse live young. Smaller antelopes tend to remain with a single mate, since they often live in areas with lower resources and larger population distribution, making it difficult for males to maintain a larger herd. Larger forest species and grazing antelope form more numerous herds however, with many females to a single breeding male who drives away competitors by means of posturing and combat. The age that an antelope reaches sexual maturity can range from 6 months to 4 years, with smaller species breeding earlier during their lifetime. Calf gestation ranges from 5 to 8 months. Antelope calves are usually born singly, and antelope females native to forested areas will usually hide their young, only coming to feed them, in order to avoid attracting predators. Grassland antelope young are born in the open instead, and must gain the ability to stand on their feet within around 15 minutes of birth. They then must keep up with the herd when they’re only a few days old. 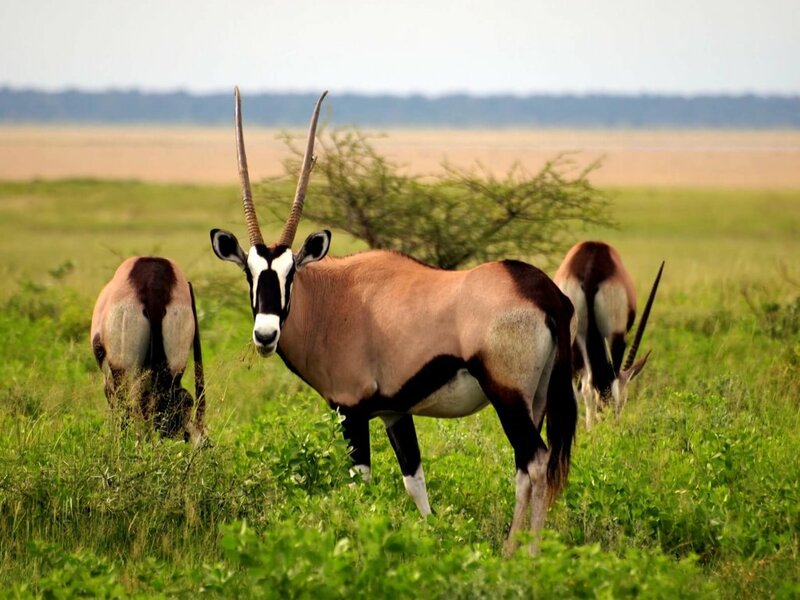 Although there are still large native populations of some gazelles in Africa and Asia, there are also many species of antelope on the IUCN endangered list, including the dama gazelle, giant sable antelope, and nyala. Loss of habitat, game hunting, poaching, and loss of grazing land to cattle farmers are some of the biggest threats to antelope populations. The Tibetan antelope, traditionally hunted for its pelt, and the saiga antelope, hunted for its horns (considered an aphrodisiac in Chinese culture) are two of the most threatened species, with the saiga listed as a Class I protected species in China and critically endangered elsewhere.